Housemarque, the creators of Super Stardust have done it again with their PS4 exclusive launch title Resogun. At it's core, Resogun is much like the arcade shooter from the 80's called Defender. A side-scrolling shooter with a screen full of aliens to kill and humans to rescue. 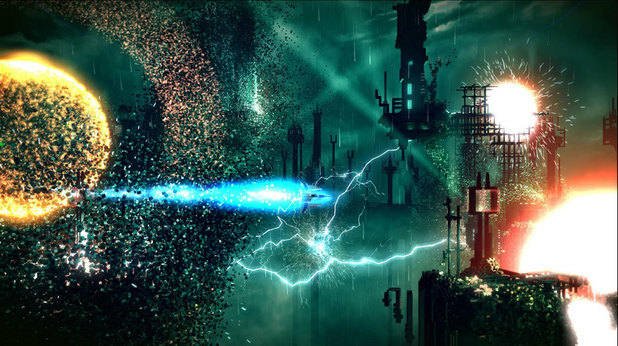 What sounds like a simple game, Resogun is anything but that. The amount of chaos that happens on your screen is pretty insane. I can honestly say I haven't had this much fun with an arcade title since Geometry Wars on the Xbox 360. After selecting one of 3 ships (each with their own stats and play style), you are thrown into a cylindrical 2D stage where chaos awaits. Your goal is simple, destroy all the aliens, beat the boss, and save a few humans along the way. While saving humans isn't necessary to beat a level, they can give ship upgrades, shields, even an extra bomb or life. So it's in your best interest to save as many as you can. When a human is in needing of being saved, the DS4's speaker will let you know. It's actually a really neat feature since it can be very hard to see the visual cue among the chaos at times. After killing a swarm of glowing enemies or meeting the multiplier requirement, a little green human is freed from his cage. You must then take him to the nearest portal where he will be rescued. Enemies release green voxels (cubes) when destroyed that you can collect to not only increase your score, but to build towards your Overdrive ability. Overdrive is basically a giant beam that destroys anything in it's path, so saving this for when you are in a tough situation is key. You also have a boost meter that once filled allows you to blast through your enemies for a few moments. Boost can be used offensively to kill a group of enemies, saved for when you need to get out of a tight jam, or even used to get to the other side of the map quickly to rescue a human. You also have two bombs in your arsenal that wipe out all aliens on the screen, giving you a few moments to catch your breath. 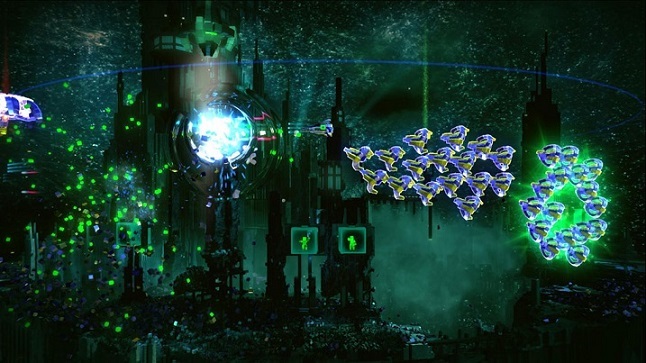 Much like any old-school shooter, Resogun doesn't really do a good job at explaining what you need to do. A brief image shows the controls before a level starts, but that's as far as it goes. The rest is on you to learn through trial and error, which may be frustrating for some people. Resogun also doesn't have the greatest replay value. If you plan on blasting through level after level, unlocking all kinds of gadgets for your ship, that's not what you will find here since Resogun only has 5 levels. However, if you love climbing leaderboards or just want to outscore your friends, you will have a blast. Visually Resogun is nothing short but stunning, running at a solid 60 frames per second at 1080p. While this may not seem like an impressive feet for an arcade game, once you start blowing things up and your screen becomes covered in tens of thousands of cubes you will really appreciate what the power of next-gen can do. Resogun's can get up to 200,000 of these fully rendered on your screen without a single hiccup and even shows off the engine by giving you an explosive slow-mo celebration every time you beat a level. Overall, Resogun is a great arcade title that any PS4 owner should own. Most of us got this game free with our PS+ membership along with Contrast last month, but for anyone who is late to picking up a PS4, you should definitely check this game out and if it even sparks a little interest in you, buy it! Housemarque plans to add plenty of things post launch, like 3D support and is even looking to the community for ideas. So for anyone who already owns this game keep an eye out for updates! - Intesnse and addicting gameplay. - Looks and feels amazing at 1080p/60fps. - Bosses are pretty easy.